There was about 30 minutes left in my ED shift and I was tidying up some patient notes, prepping some kiddos for discharge, when I saw a new patient pop up on our screen. The triage note read: “11 month-old female, sudden refusal to use left arm, no other complaints.” I became embarrassingly giddy. I turned to my attending and asked if I could squeeze in a new patient. She smiled and replied, “Did you see who just arrived in room 8?” By this point I was blushing as I enthusiastically nodded. A nursemaid’s elbow is a partial dislocation of one of the forearm bones (the radius) from the other bone of the forearm (the ulna) where they meet at the elbow. It sounds a lot worse than it is. Basically, when kids are young (generally under three years), their ligaments are looser and their bones aren’t fully developed. The nursemaid’s elbow is called such because it happens often in small children who are pulled up by their hands or forearms by their caregivers. Most physicians in the ED really love this diagnosis. You have a parent come in with an otherwise healthy child in minimal to no pain. The parent is often beside him/herself, feeling horribly guilty because he was just trying to get the kid from point A to B, and now the kid suddenly can’t move his arm anymore. The doc gets to come into the room, reassure the parent, pop the bone back into place with a very fast and simple maneuver (SO much less traumatic than popping a shoulder back into place), present the patient with a lollipop, and watch the kid and parent delight as the the child miraculously uses the arm like nothing happened. It’s pretty gratifying. Of course I ended up failing my first attempt at the reduction (I was too ginger with the sweet child) and the attending just performed it quickly to avoid the patient (parent?) getting worked up. I’m optimistic for my next opportunity. I also failed my recent attempt at a spinal tap in a febrile neonate. The kid, however, slept through the whole thing, so maybe a partial success? Last month I placed an umbilical line in a 26-week gestational age newborn without complication. And I don’t mean to toot my own horn, but I think I’m developing a skill for performing decent quality EKGs on newborns while keeping them asleep. (10 is a lot of electrodes to fit onto such a small surface area!) It’s one of the rare occasions where my performance elicits a “strong work” from my resident/fellow. 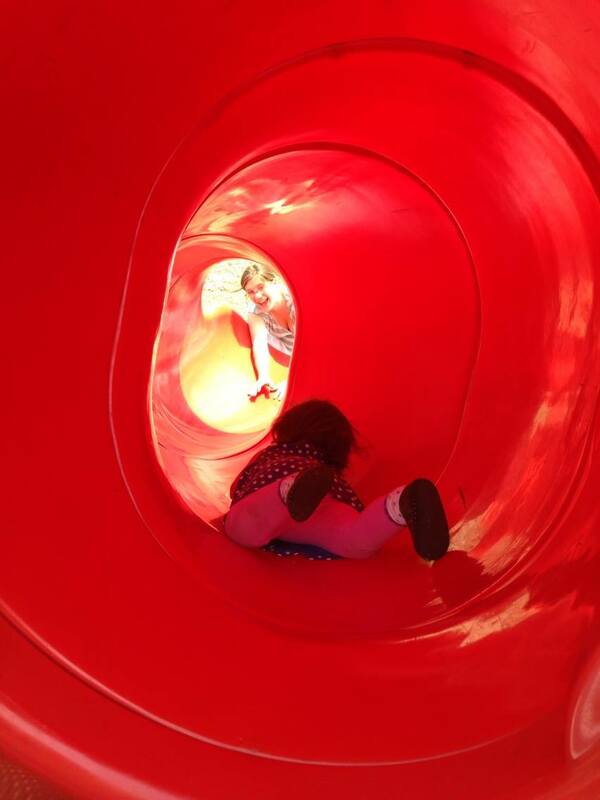 On the topic of early childhood injuries, it is a miracle that, by the way my child launches herself down a slide head first, we haven’t ended up with more injuries, other than the face plant and the broken wrist before her first birthday. Thanks so much, Ellen, for capturing this great moment!